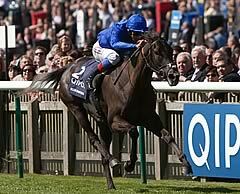 The fast-finishing Blue Bunting gave Godolphin a third win in the QIPCO 1000 Guineas and trainer Mahmood Al Zarooni his first British Classic victory when leading home Together by three-quarters of a length to strike at odds of 16/1 on the Rowley Mile. 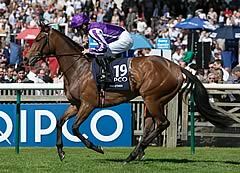 The previous 1000 Guineas winners were Kazzia (2002) and Cape Verdi (1998). Confirming the winner on course for the Investec Oaks on June 3, Al Zarooni, who joined Saeed bin Suroor as Godolphin's second main trainer in Dubai and then Newmarket last year, said: "It's very, very special and I am very pleased for the filly. Frankie did a good job on her. "This is my first Classic success in England and it's because of His Highness - we follow what he says because he has the experience. He knows the racing in England. "I have a very good team behind me who help me. Honestly, I don't have experience of English racecourses. "It is the dream to win big races in England, especially the Guineas and the Derby which are among the biggest races in the world. "We always thought that she was a mile and a half filly, that she was an Oaks filly and she wanted soft ground. She has shown us today that everything we thought about her was wrong! "I hope she's an Oaks filly because she has shown so much speed here. She stayed here in Newmarket over the winter." Al Zarooni's QIPCO 2000 Guineas runner Casamento is another on course for Epsom after finishing unplaced yesterday, with the Investec Derby his target (June 4). The trainer reported: "Casamento is fine this morning - he is a stayer. "A Classic in England is very special, especially in Newmarket. You have the best horses and the best trainers and it's not easy to win big races." The Aidan O’Brien-trained Together ran a great race under Colm O’Donoghue to bely her 33/1 odds and finish three-quarters of a length second to Blue Bunting in the QIPCO 1000 Guineas. O’Donoghue was suspended for two days having been found guilty of using his whip with excessive frequency aboard runner-up Together in the QIPCO 1000 Guineas. The suspension will take place on May 15 and 16. Rod Collet, trainer of fourth-placed Nova Hawk, said: “It was only the second time she has run on a straight course and she maybe needed more experience. It was her first time on that ground but she seemed OK on it and was coming on well at the end.